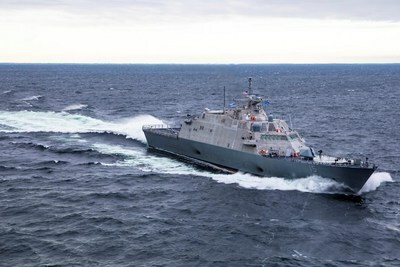 MARINETTE, Wis., Feb. 6, 2019 /PRNewswire/ -- Lockheed Martin (NYSE: LMT) and Fincantieri Marinette Marine (FMM) delivered another Littoral Combat Ship, the future USS Billings (LCS 15) to the U.S. Navy. "We are proud to support the U.S. Navy surface fleet with delivery of another highly lethal and agile littoral combat ship," said Joe DePietro, vice president of Lockheed Martin's Small Combatants and Ship Systems. "The Lockheed Martin-led industry team has hit its production and efficiency stride, and we know LCS will fulfill critical missions around the world for many years to come." "Fincantieri Marinette Marine is focused on delivering capable and proven warship to the U.S. Navy," said Jan Allman, president and CEO of Fincantieri Marinette Marine. "This milestone is a testament to our hot serial production line, and the skilled test and trials collaboration across the entire LCS Freedom team." Gibbs & Cox, the nation's leading independent maritime solutions firm specializing in naval architecture, marine engineering and design, is headquartered in Arlington, Virginia. The company, founded in 1929, has provided designs for nearly 80 percent of the current U.S. Navy surface combatant fleet; approaching 7,000 naval and commercial ships have been built to Gibbs & Cox designs.